Once I finished college all I wanted do was work. Surprising I know! I had applied for a few jobs after leaving education, but I was lacking practical experience. Luckily I managed to get an interview via Jobs Growth Wales for CAIS to work in their new Social Enterprise; Porter’s Coffee Shop and Bistro in Colwyn Bay. I didn’t know much about Social Enterprises, and thought it was a really interesting concept. To access Jobs Growth Wales you had to be unemployed and not in education. I went along to the interview, and later that day I received a phone call saying I had been successful! A week later I started work at Porters and I thoroughly enjoyed it. The placement at Porter’s was initially for 6 months, and I was lucky enough to be offered a permanent full-time position after this tenure. The team were friendly and it was the ideal environment to learn the trade. I enjoyed serving our regulars and as my confidence grew I decided that I wanted to further my career. After working at Porter’s for 12 months I saw that there was a vacancy for a Café Supervisor at Troop café in Llandudno (another CAIS Social Enterprise) which I applied for and was successful. I enjoy working at Troop Café because as a Social Enterprise it is more than just a job. All the profits are reinvested in CAIS’ veterans’ services and people love the veteran memorabilia that decorates the Café. 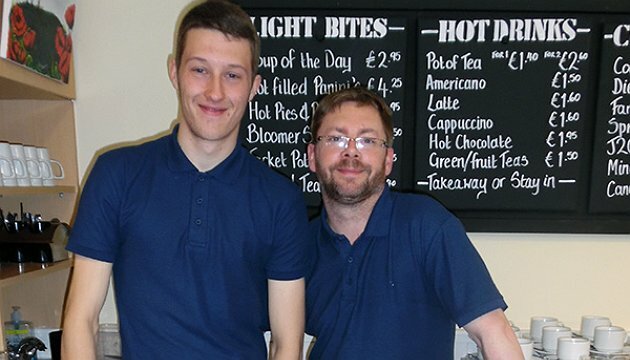 Working in Porter’s Coffee Shop and Bistro was my first proper job – over the last 17 months I have developed skills such as communication, problem solving and more importantly I feel far more comfortable working independently and developing my management skills knowing that CAIS is there supporting me every step of the way.